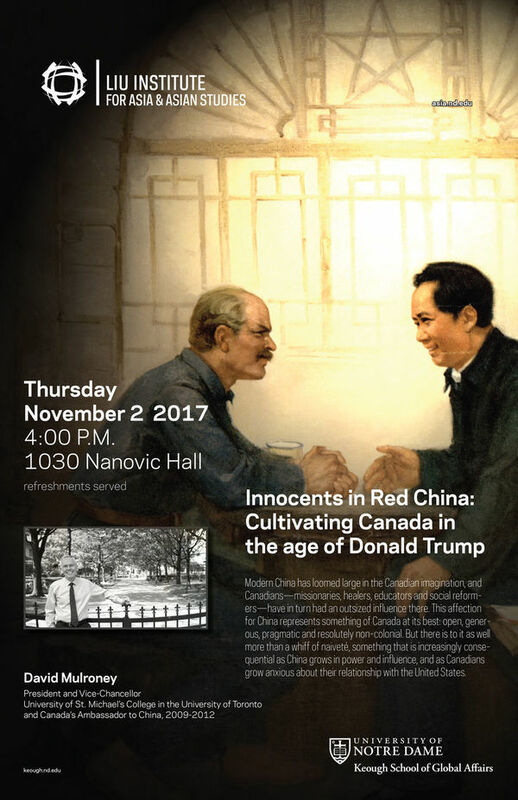 Lecture: "Innocents in Red China: Cultivating Canada in the age of Donald Trump"
Modern China has loomed large in the Canadian imagination, and Canadians—missionaries, healers, educators and social reformers—have in turn had an outsized influence there. Norman Bethune, a doctor from rural Ontario who died while serving as a surgeon with the Communist 8th Route Army, is still one of the best-known foreigners in China, commemorated in an essay by Mao. Pierre Trudeau and fellow Quebec intellectual Jacques Hebert traveled to China 1960, when the country was in the midst of the disastrous Great Leap Forward. Two Innocents in Red China, their book about the visit, is informed by a sense of China’s destiny that would continue to inspire Trudeau. A decade later, as Prime Minister, he introduced a formula for recognition of the PRC that paved the way for diplomatic relations between China and many other countries. Before becoming Prime Minister himself, Justin Trudeau, Pierre’s son, described China, with its “basic dictatorship,” as the administration he most admired in the world, much to the delight of China’s leaders. This affection for China represents something of Canada at its best: open, generous, pragmatic and resolutely non-colonial. But there is to it as well more than a whiff of naiveté, something that is increasingly consequential as China grows in power and influence, and as Canadians grow anxious about their relationship with the United States. David Mulroney served as Canada’s ambassador to China from 2009-2012. He is currently President of the University of St. Michael’s College, which is federated with the University of Toronto. His book about Canada-China relations, Middle Power, Middle Kingdom, won the J.W. Dafoe Book Prize for 2016. Cosponsored with the Keough School of Global Affairs.